When it comes to prepping for an Easter party or celebration, M&S should definitely be your first stop. From traditional to trendy pieces, there is a whole range of showstoppers which make the perfect presents, and honestly, I’m a little obsessed. 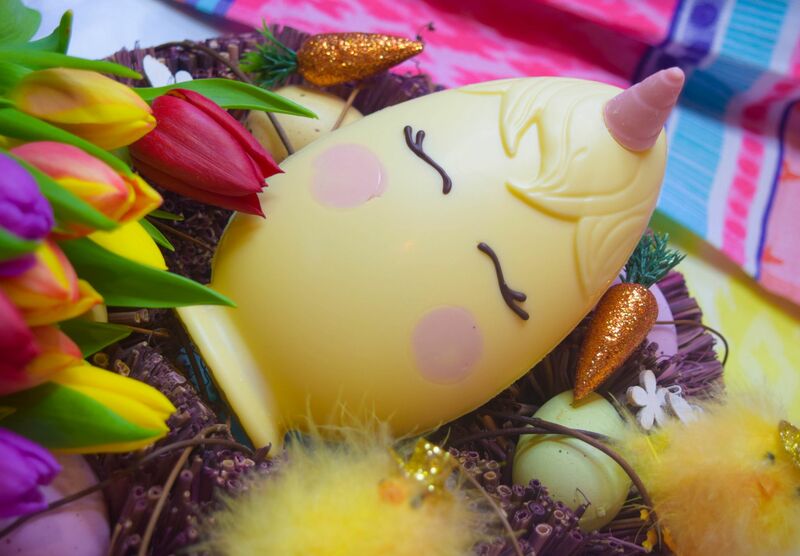 Moonbeam the Unicorn Egg is possibly one of the cutest eggs I’ve seen. Hand decorated, and made up of sweet white chocolate, this is going to be a complete home-run for anyone looking for something a little whimsical this season. 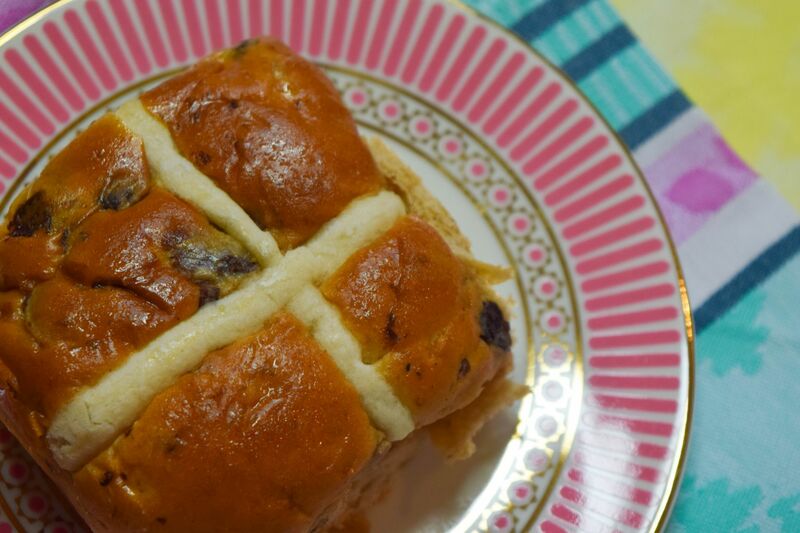 If you’re a traditionalist, you’re going to need to stock up on some hot cross buns, and M&S’ are a classic for a reason. These are the softest, squigiest buns I’ve tried, and they’re delicious plain as they are toasted. Paired with a pot of tea, these make an indulgent treat over the Easter weekend, and they’re even yummy as a breakfast option! 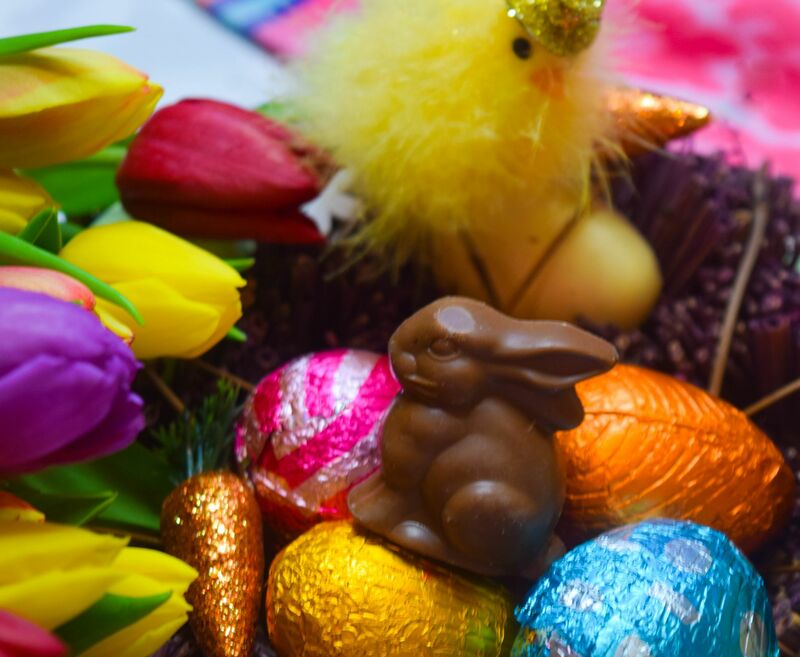 Finding fun pieces for your Easter egg hunt can be a bit of a pain, but M&S has made your life so easy with their bags of Hide and Seek eggs, as well as their Cheeky Chicks, which are available in milk and white chocolate varieties. Another of the new products M&S have introduced for Easter is the Bubbly Bunny. If you’re a fan of Aeros, you’re going to love this. Bubbles of milky chocolate are always going to be a delight, and the fact that this clocks in at a reasonable 123 calories means that you’ll be able to enjoy it guilt-free! Last, but certainly not least are these gorgeous chocolate egg biscuits. Crisp chocolatey bases are covered with white and pink chocolate, and finished with speckled eggs. All chocolate and crunch these are a perfect mid-afternoon treat, and could add a gorgeous Easter twist if you’re having people over for coffee. 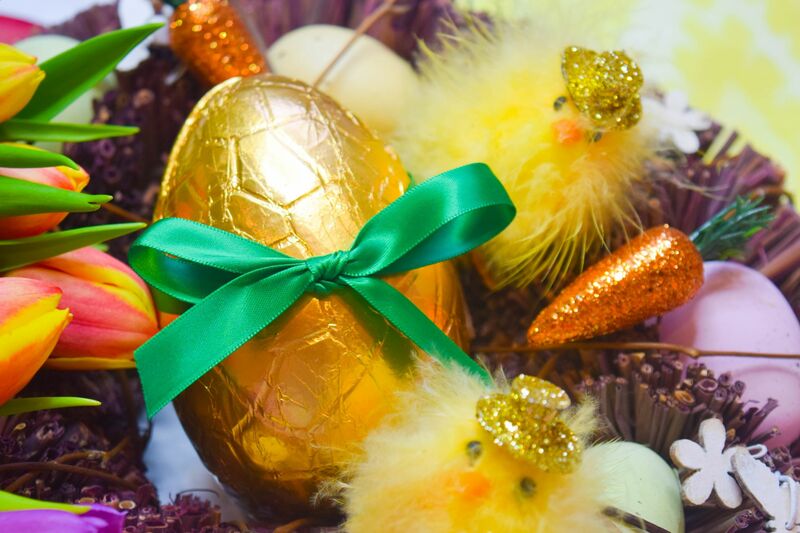 As you would expect – M&S have absolutely hit it out the park for Easter – you can find out more about the range, including food & gift ordering here. When it comes to Easter, I sometimes feel it can get a little forgotten about. Between spring break holidays and looking forward to summer, the celebration can get a little lost in the mix. So, I was absolutely thrilled with Prestat sent over their gorgeous London Gin Truffle Easter Egg. After all, if there’s something I like more than Easter, it might just be gin! Tucked inside the shiny box, is this absolute jewel of an egg – all gold foil and ribbons, this is an egg of gin and chocolate lovers alike. Split into two halves, it opens to reveal perfect truffles tucked inside. I absolutely love the traditional gold foil and silky ribbon, and it looks beautiful tucked into my Easter display. As well as being absolutely adorable, the egg and the truffles tucked inside are delicious. The milk chocolate which makes up the egg is flavoured with lemon oil, which gives it a yummy freshness. There’s also popping candy mixed in, so it crackles in the mouth. The truffles are equally moreish – covered in silky white chocolate, the centres are made up of silky milk chocolate ganache flavoured with London Gin. 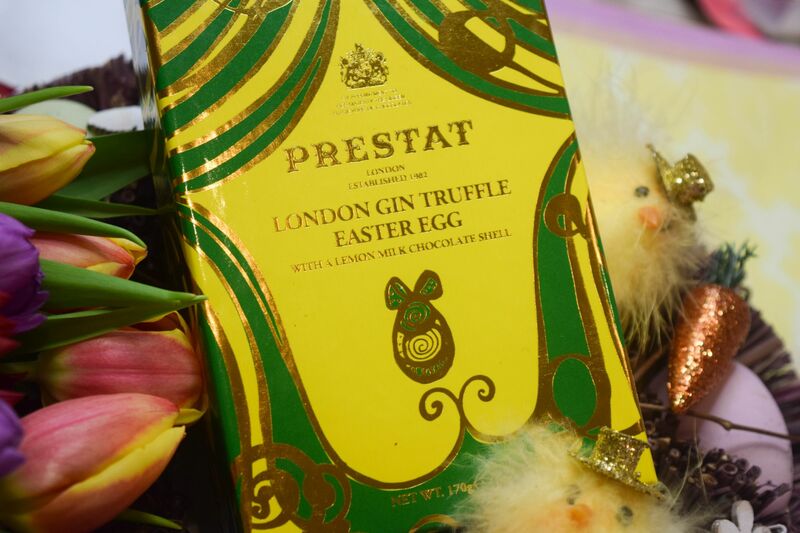 If gin isn’t your thing, don’t worry – Prestat have an incredible range of Easter goodies to choose from! 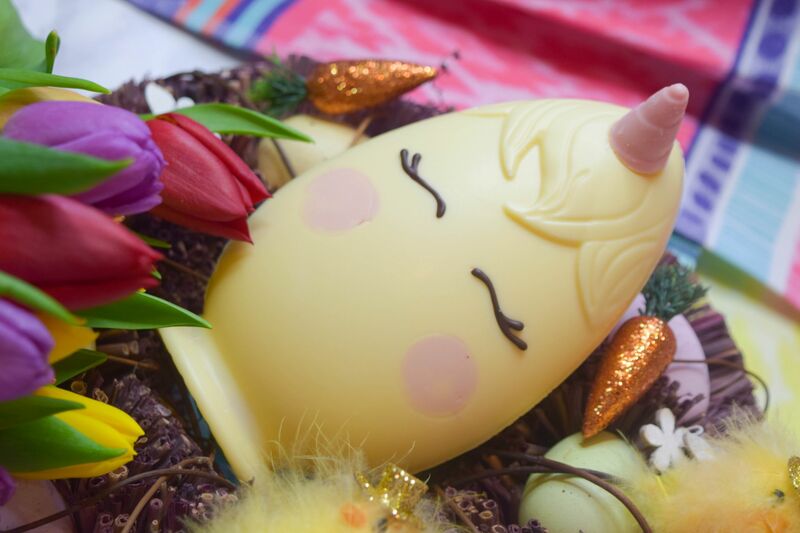 From the NEW Ruby Chocolate Easter Egg (£17.50) and Popping Prosecco Easter Egg (£17.50) to the London Gin Easter Egg (£17.50) and Sea Salt Caramel Easter Egg (£17.50) – Prestat(www.prestat.co.uk), chocolatier to Her Majesty The Queen, has a delicious range of beautifully packaged eggs to treat your loved ones to this Easter. When it comes to restaurants, there aren’t too many with an entrance as dramatic as Dine’s. Perched on the second flood of the Lyceum Theatre, you’re met with a living wall as you head up for the restaurant – it’s a nice touch which continues through to the dining room where a lit tree grows through the tables. 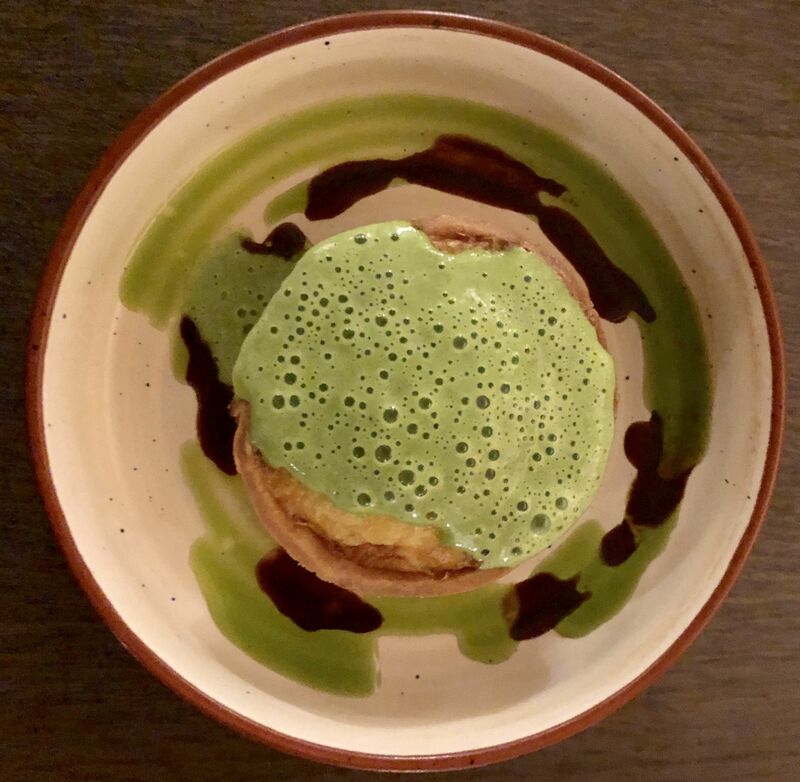 A couple of weeks back, we were kindly invited to try the new Springtime Market Menu, and if you’re looking for a spot to visit this week, this is the place to head to! We kicked things off with a cocktail from Dine’s new Premium Cocktail List. 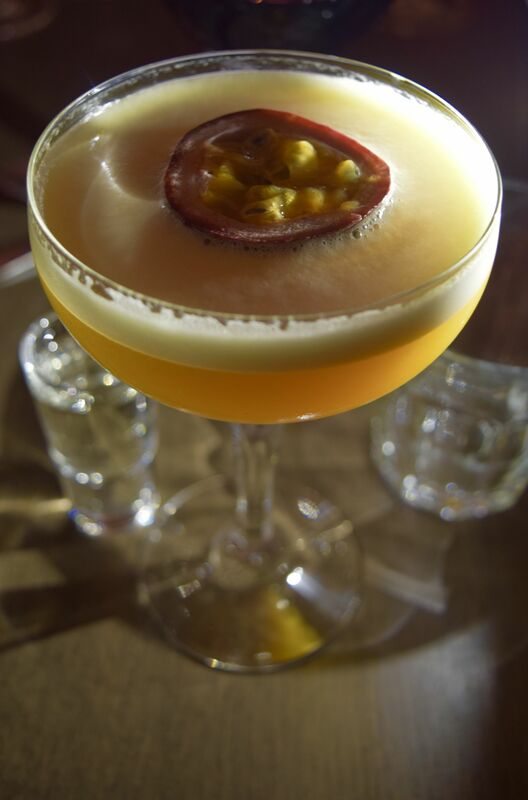 The brainchild of Head Barman Alessandro, these are cocktails which you’ll not find anywhere else in Edinburgh. 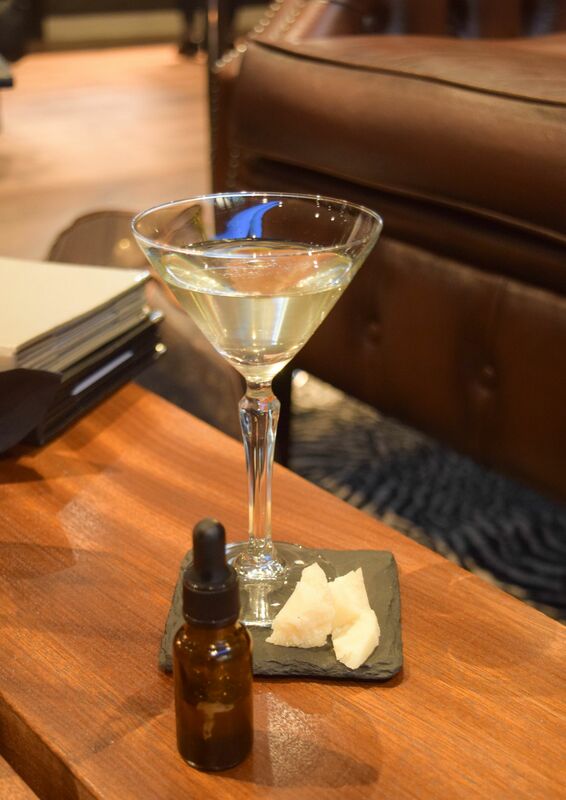 Despite not being the world’s biggest drinker, I opted for the Martini & The Truffle (£10.50). With vodka infused with olive oil, Vermouth and Truffle Oil drops, this has to be one of the tastiest (and most savoury) cocktails I’ve ever tried. Served alongside hunks of parmesan, it was a delicious way to start the evening. 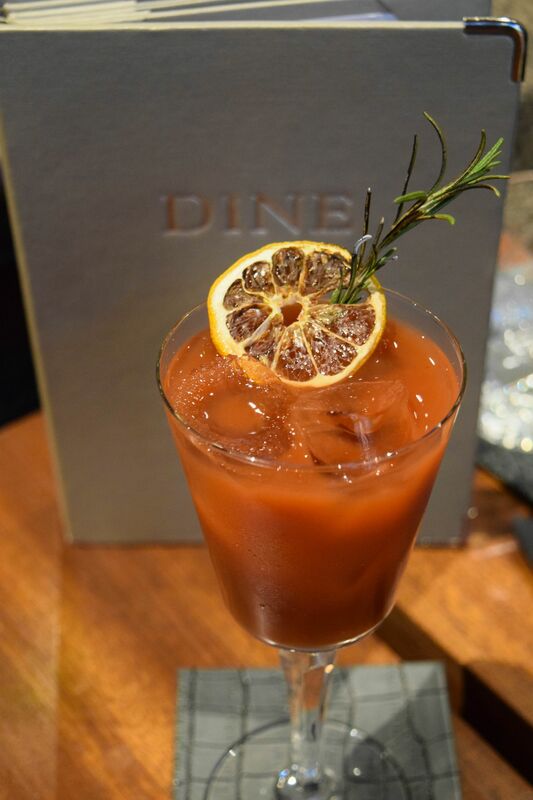 We also opted for a Virgin Mary – delicious, and beautifully presented – Dine’s cocktail lounge is a stunning spot to enjoy some pre-dinner or theatre drinks. I just loved the chic, club feel, and the Chesterfield Sofas were wonderful to sink back into, and relax before heading through to lunch. After chatting with Alessandro and enjoying our drinks, it was time to head through the the dining room, where we munched on spiced hummus and homemade sourdough whilst settling on our menu choices. When dining out, I’m trying to order away from my usual favourites, so I opted for the Onion Bhajis, served with a fresh raita and grilled halloumi. It was absolutely delicious – the bhajis were a delight – crisp and full of gentle spice, paired with the salty grilled halloumi and peppery salad, it was a yummy choice which made me glad to have stepped a little outside my usual options. 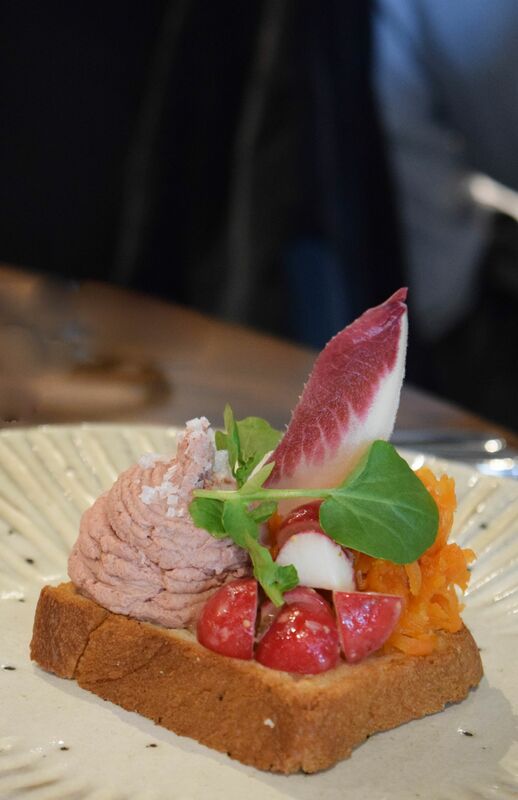 We also opted for the Chicken Liver Parfait served with toasted brioche and it was equally delish. Rich and savoury, spread over the buttery toast was absolutely divine. I loved the dressed radishes too – they brought a fresh and peppery kick to an otherwise rich dish. The first main course to be ordered was the Plaice which came served with Cafe de Paris butter and new potatoes. I loved the mild, almost sweet flavour of the Plaice paired with the mustardy Cafe de Paris butter was divine, and paired with the fresh peas and new potatoes, the whole dish was really lovely. 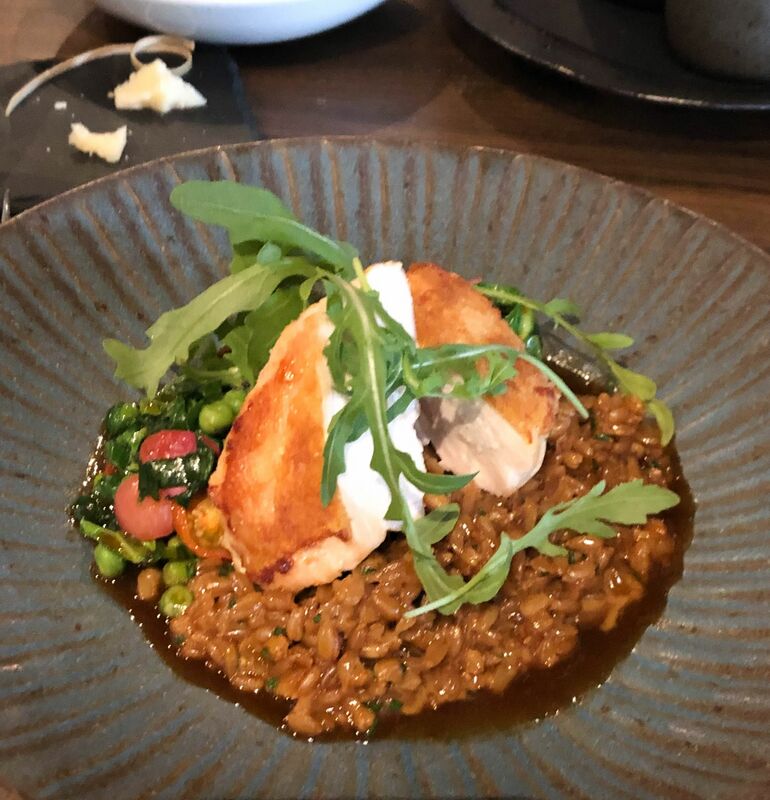 I opted for the roast chicken breast served with barley and vegetables. I’m not quite sure how, but I managed to not photograph this one with my camera (a bit of a blogger fail) but it was incredible. The rich, slightly salty sauce paired well with the chicken which was cooked to perfection – all crisp skin and tender meat. To be absolutely honest – we over-ordered – getting both chef’s potatoes (New Potatoes with herbs) and chips served with aoli, but they sounded too good to resist. Even though we could hardly make a dent in them, but they were incredible – the potatoes were crisp and delicious, whilst the chips were perfection – all crisp coating and fluffy insides. 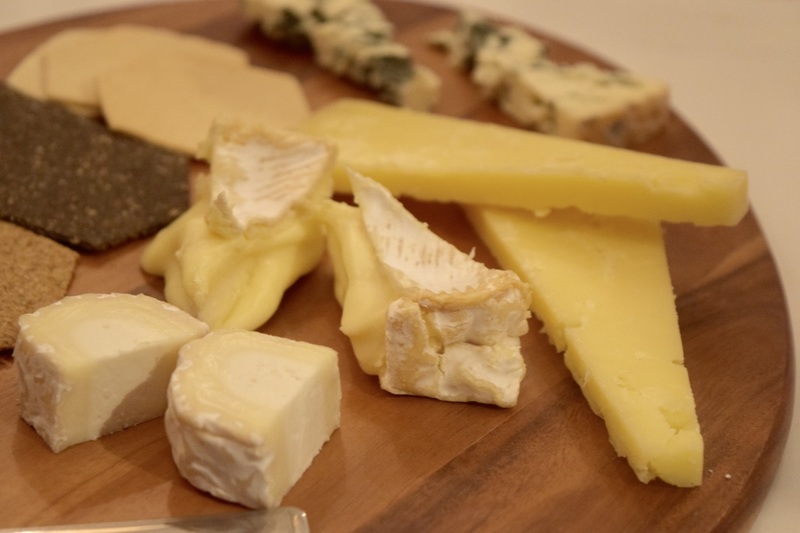 We couldn’t resist the lure of dessert, and we shared a cheese plate, which featured a selection of British and Continental Cheeses (alongside frozen grapes and homemade chutney), as well as the Lemon Tart. A tart lemon filling sat squarely inside buttery shortcrust, and it was an indulgent way to end the afternoon. Not only is Dine one of Edinburgh’s must-visit restaurants, but the value of the Market Menu is really impressive. Served from midday, and including tea or coffee, it’s £15.50 for 2 courses or £21.50 for 3! When it comes to choosing supper spots in Edinburgh, George Street’s Printing Press always tops the list. I’ve been lucky enough to review it a couple of times now, and each time I visit it gets even better. I’m in love with the moody interiors which are all mirrors and velvets, and the food is seriously impressive too! 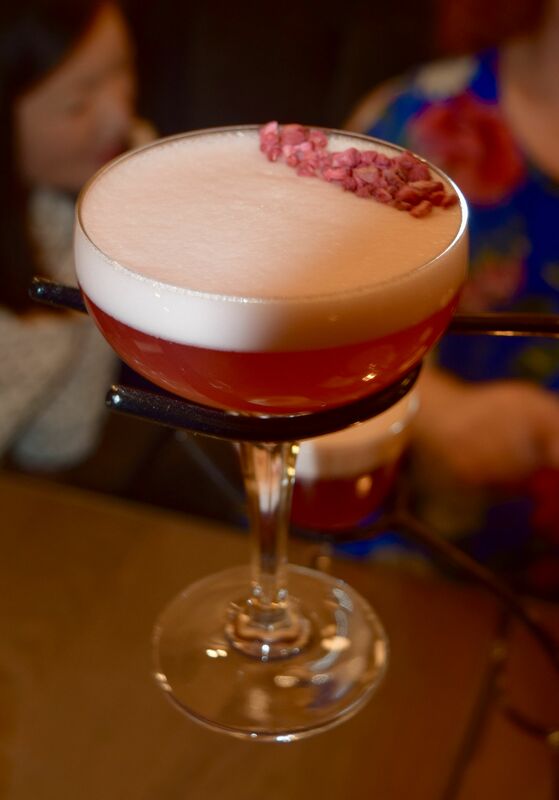 In addition to the restaurant serving up some of Edinburgh’s best food, the bar shouldn’t be missed either. They have their own No 22 Gin, and their cocktails are delicious to boot. We kicked the evening off with a cocktail tree (priced from £70) which held Pornstar Martinis, Devil wears Principal and French Martinis. Over the course of the evening I sampled a Pornstar Martini (more on that later), as well as a Devil Wears Principal. Both were exactly what I was in the mood for – fresh, fruity with a kick (much like the Principal George Street itself). After getting suitable hydrated, we were shown through to the dining room, where the fun could really start! The new Spring menu has just launched, and it’s worth travelling for. Filled with seasonal Scottish produce, it’s a celebration of call things Springtime, and I’m already plotting a return visit. The evening kicked off with and absolutely divine Orkney crab and leek thermidor tart (£8). 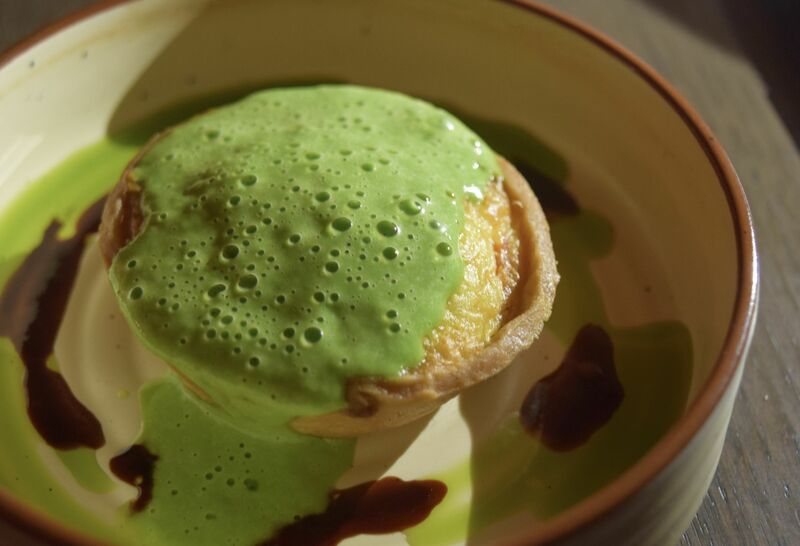 The most buttery, delicate pastry base held soft morsels of crab which were topped with a gloriously bright leek foam. Burrata, red chicory, blood orange, pine nuts, chilli dressing (£7.50) was up next. A riot of colour and flavour, this truly tasted like summer evenings. The burrata was a cloud of soft cream, which positively oozed just by looking at it. The richness was nicely cut through with peppery chicory, fresh blood orange segments and a fiery chilli dressing. Pine nuts and crostini provided a perfect amount of crunch. Honestly, when it comes to eating out, I’ll rarely order the fish. 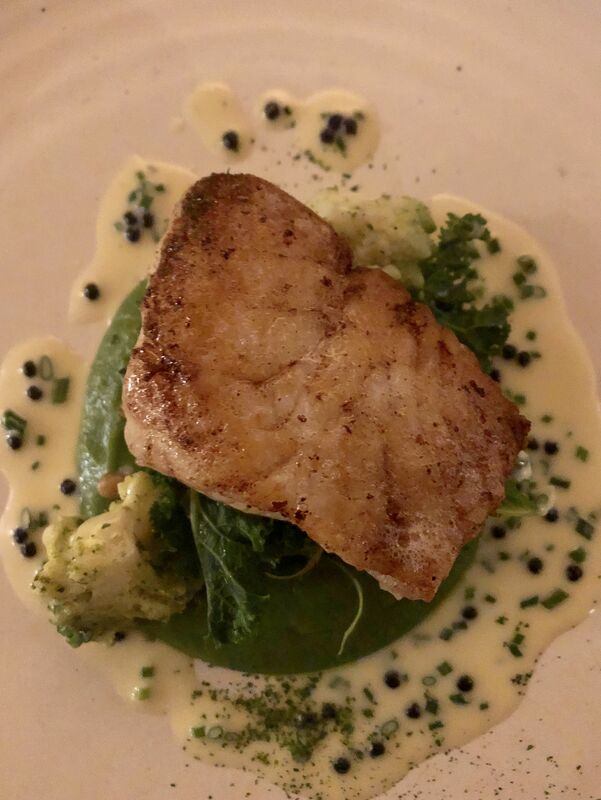 I’m not sure if I’m more or a carnivore or just a creature of habit, so the Roast Scrabster cod, broccoli, kale, caviar butter sauce (£16.50) was a lovely change. The cod itself was glorious – it flaked into translucent morsels which more than held up against the greenery it was served with. The caviar butter sauce, as you might imagine, was deliciously rich. Slightly salted and flavoured like the sea, I could have happily spooned it up. Talking of my carnivore tendencies, venison is quite possibly my favourite meat – rich and lean, I love the melt-in-the-mouth texture a good hunk of the stuff has, and since I’m scared of over-cooking it at home, I only ever enjoy it in restaurants. 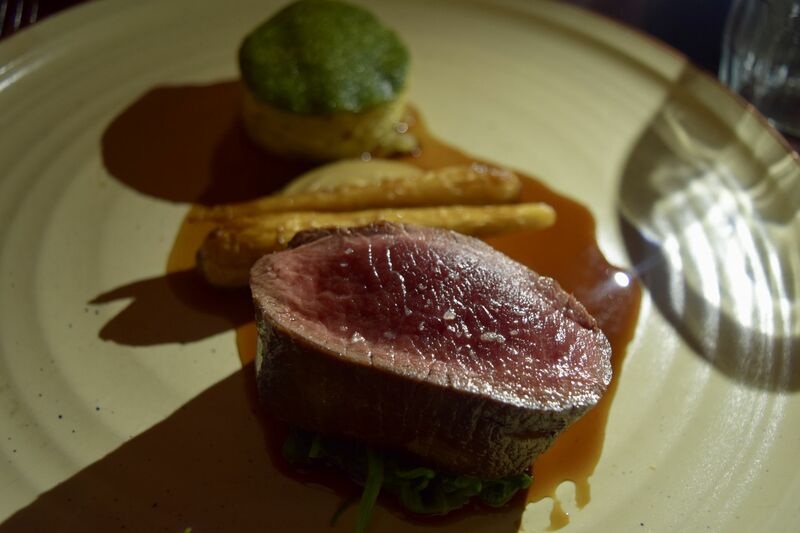 So, I was delighted when Pan-seared venison, caramelised celeriac, spinach, brioche herb crumb (£19) was served. With a seared exterior and rare middle, the dish was a true celebration of Scottish produce. The meat itself was a triumph – full of flavour, it was truly the stuff of last requests. The vegetables served alongside were similarly tasty – perfectly roasted parsnips, creamy potatoes and sweet celeriac. 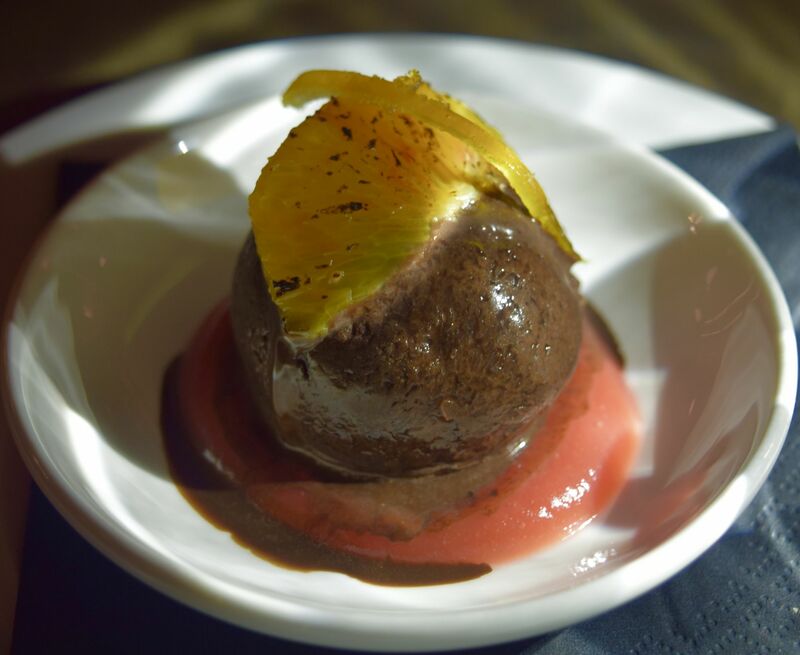 After all our savoury goodies, it was time for a palette-cleanser which came in the form of chocolate sorbet served with blood orange. Normally, a scoop of this comes alongside an orange rice pudding (yum) but we felt two desserts might just be too much of a good thing. The sorbet itself was incredibly flavourful – rich and deeply chocolate-y, none of us could believe it was a sorbet rather than a full-blown ice cream as it was so silky smooth. 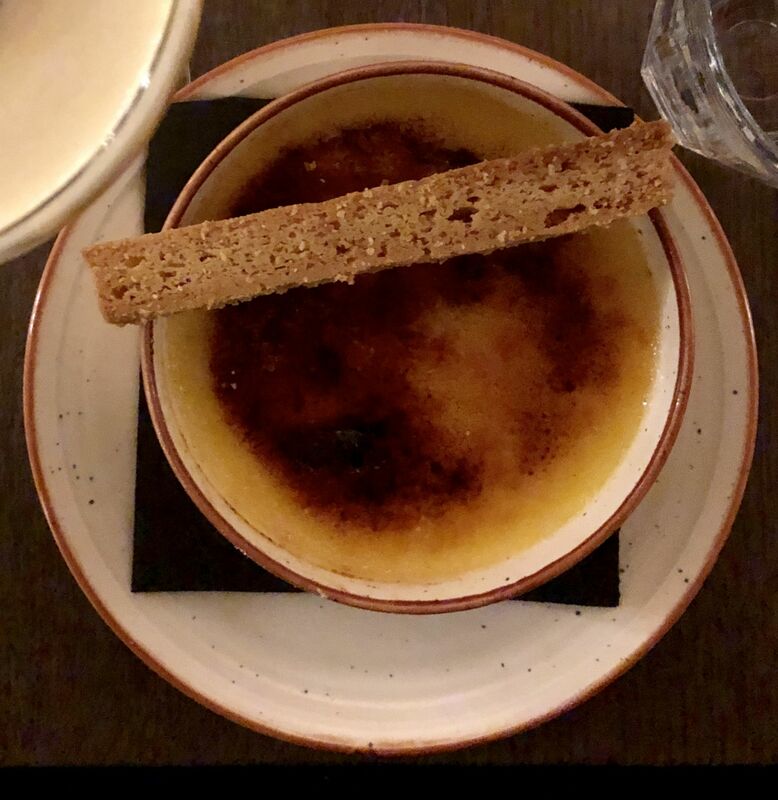 As if we hadn’t feasted enough, we ended the evening with an iconic dessert – a Vanilla crème brûlée, served with sablé biscuits (£6). There’s something wonderfully theatrical about cracking the well-fired crust. The custard below was silky smooth, fragrant and studded with vanilla beans. Served alongside (another) Pornstar Martini, we debated our favourite dishes (all of them) and whether to sip the martini’s accompanying Prosecco or pour it in (undecided). As if all of the culinary goodness wasn’t enough, we were sent home clutching bags of homemade chocolate truffles and bottles of house gin! Thank you so, so much to The Printing Press, The Principal George Street and to Jigsaw PR for such a wonderful evening! It can feel like every time you visit Edinburgh, there is a new spot to visit, and as a result, my wish list of haunts grows longer by the week. One of the spots on my hit list was Otro, a stunning Italian restaurant set in the heart of the Capital’s West End. 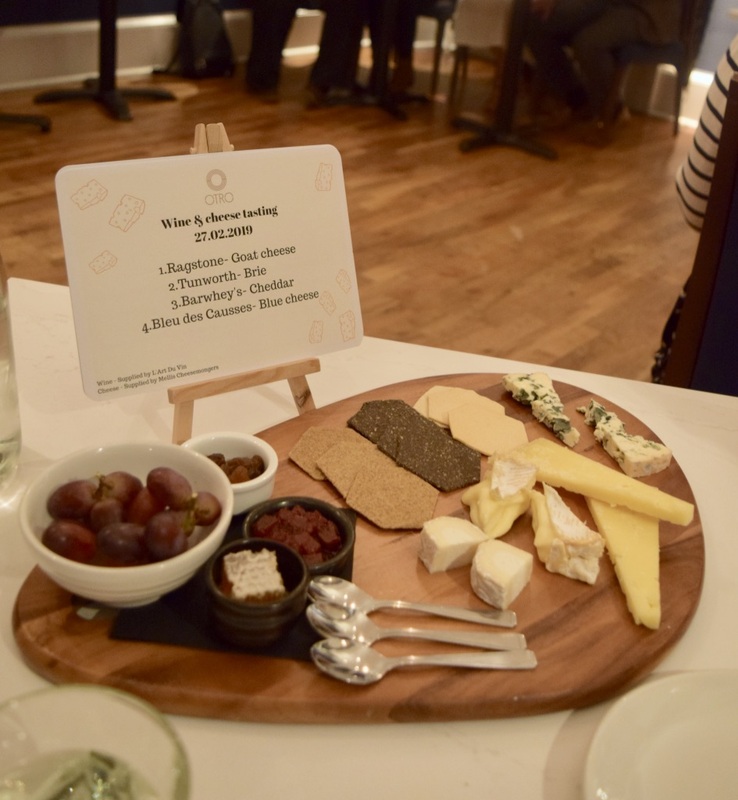 I’d heard so many people rave about their a la carte options as well as their Sunday lunches, so when an invitation to join them for an evening of wine and cheese popped up, I couldn’t resist! 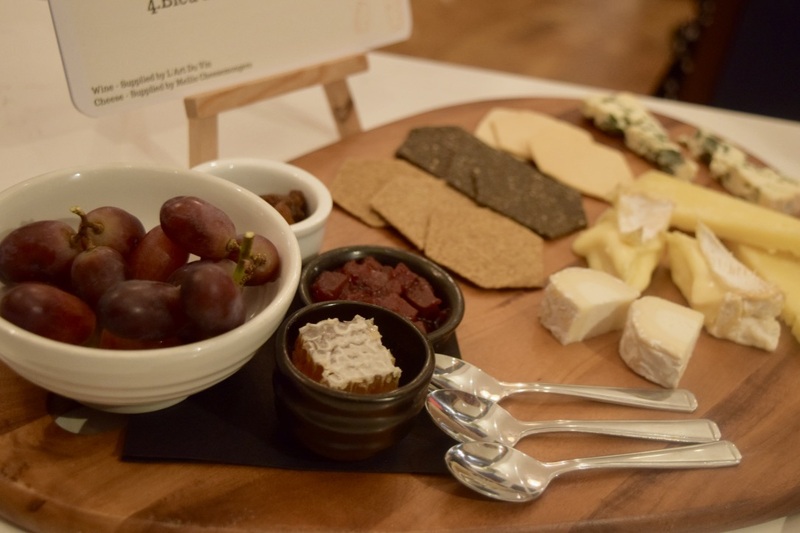 The evening, held in association with independent Scottish wine merchants L’Art du Vin and fromage icons I.J Mellis Cheesemongers, was just the ticket for a chilly mid-week evening. As someone who loves a good cheese, but isn’t the world’s biggest wine aficionado, I always appreciate a little guidance on what goes with what, and my evening at Otro did not disappoint. 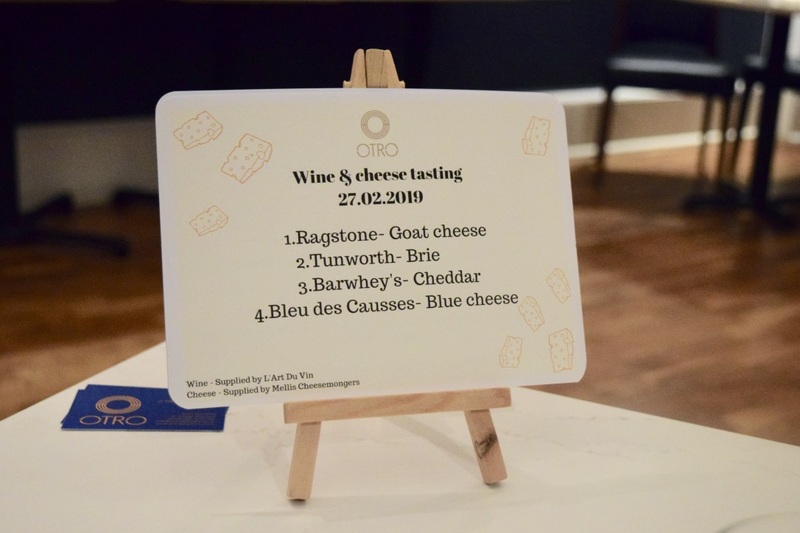 Although Otro don’t seem to host these wine and cheese evenings regularly, all the wines served are on their wine list, and staff have all been trained to know exactly what goes with what, so you’ll be in good hands when you visit. We kicked off proceedings with a Ragstone Goat Cheese and Fendant, les Deux Cimes, Valais – a Swiss white wine grown by a Scotsman. The pairing was divine, and the wine my favourite. Dry and zesty, it was an easy drink which I kept returning to throughout the night. 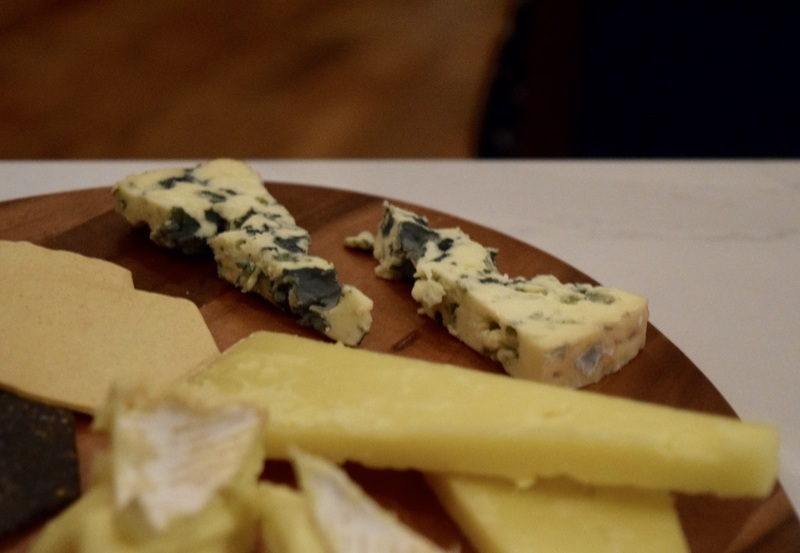 It paired with with the tang of the Ragstone, and cut through the cheese’s creaminess. Next up was the Tunworth Brie which we enjoyed with Le Joufflu – a rich well-bodied red. Although not technically a brie (the Tunworth is English after all), it is a wonderfully savoury option which I regularly pick up from Mellis’ St. Andrews location. The wine is from a niche grower, who have their own Parisian wine bar located in the Marais, so getting to try it felt like such a treat! 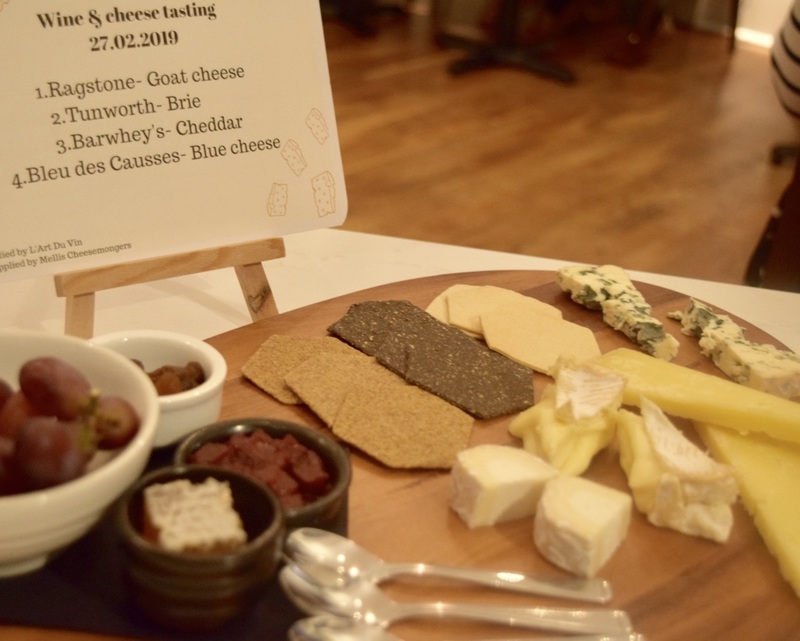 The most traditional of the cheeses on offer was Barwhey’s Cheddar – a rich and creamy cheddar which feels absolutely made to be enjoyed as part of a Ploughman’s Lunch. Served alongside Mellis’ own Beetroot Relish it was really special. Served alongside Hacienda Grimon, the pairing packed a serious amount of flavour. The evening finished with Bleu de Causses paired with an absolutely delicious Maury, Domain Lefage. The mix of rich blue cheese and sweet dessert wine was perfectly balanced, and I loved how the cheese didn’t feel too overpowering. It felt like a perfect way to end an evening, and we’re already planning a return visit! Thank you to Otro for hosting the event, you can find out more about the restaurant here.